Hello fans……well random people who come across my site by mistake haha. 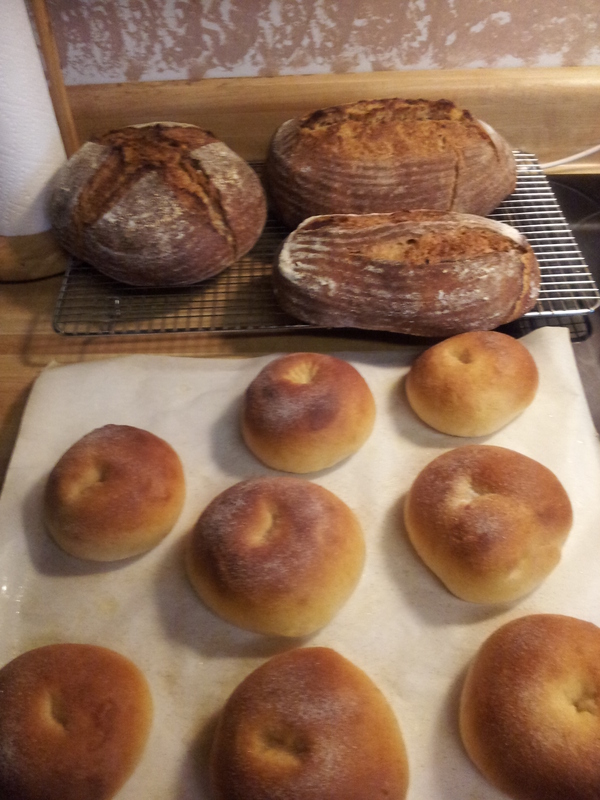 Today i was rather excited to make a bread using old bread i made in to bread crumbs. 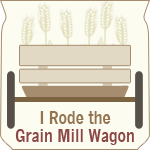 i already had bread crumbs from another batch of seeded whole grain bread. so that’s going to give it a great flavor. 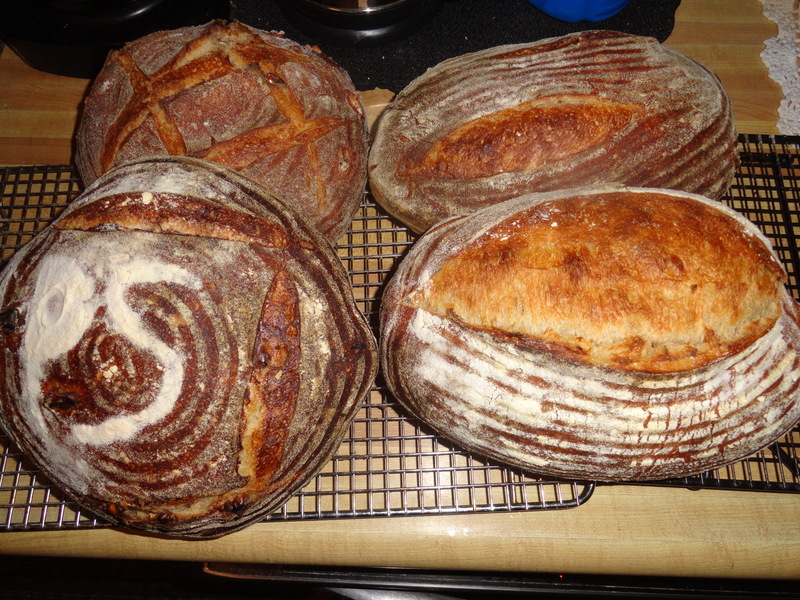 Ive been wanting to make a sourdough using old bread for a while now, but just never got around to it. Making bread with old bread is nothing new. 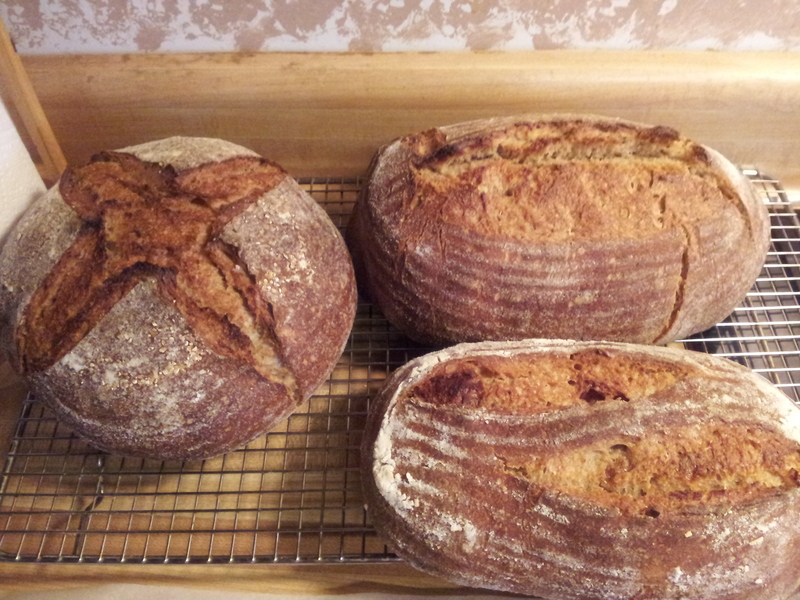 I’ve read a few older recipes that old bread was used so Europeans must have been doing for a long time. It’s a great way to utilize bread. So i used one of my one day bread recipes and replaced a small portion of the flour with bread crumbs. Also i make a few baked doughnuts just used one of my brioche recipes and buttered and put cinnamon- sugar on them. p.s i did find the idea on another site but it was my recipe. I ran out of bread so i though i would bake a few loafs of San Fran bread. I like to make a few and freeze some . Did two with and 2 with out walnuts. Im not going to post a recipe since its my secret recipe but ill post some pictures. 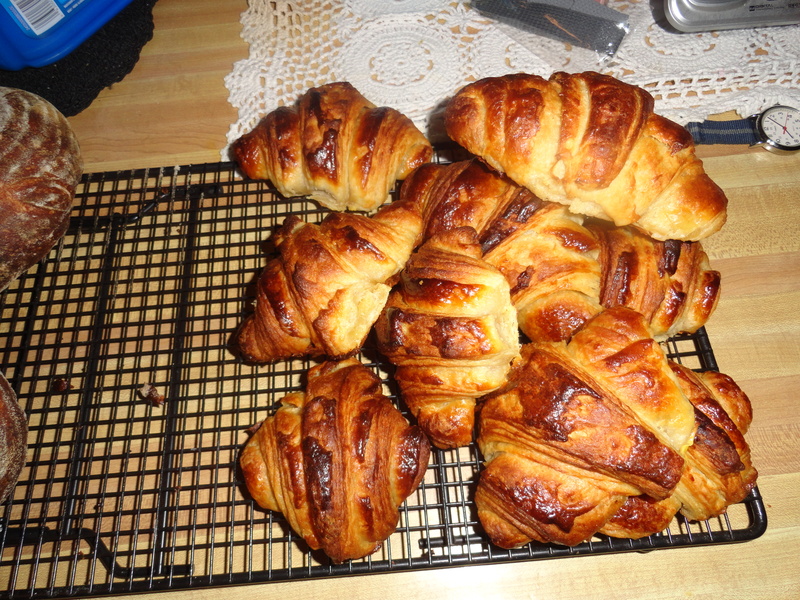 Also made a few croissants but i change the recipe and measured wrong but they will still taste the same. I have one more thing to add for today, Ive hit a speed bump in getting my license for my home kitchen. One thing we have a dog and apparently you can have any pet’s in your house you want to get a a license to sale my breads at a farmers markets. Also are water comes for a well and is tainted and you have to have clean water. The water i use is boiled, filtered and put through UV lights. sometimes i buy it. So i have to call the Pennsylvania Department of Agriculture to see if i can pass with just using bought water for now and about the dog. I could have just read the wrong thing so i want to make sure. Other alternative would be to find somewhere else to do it or just open my own bakery. This is not a sourdough post but ill put them on here since i’m making them . 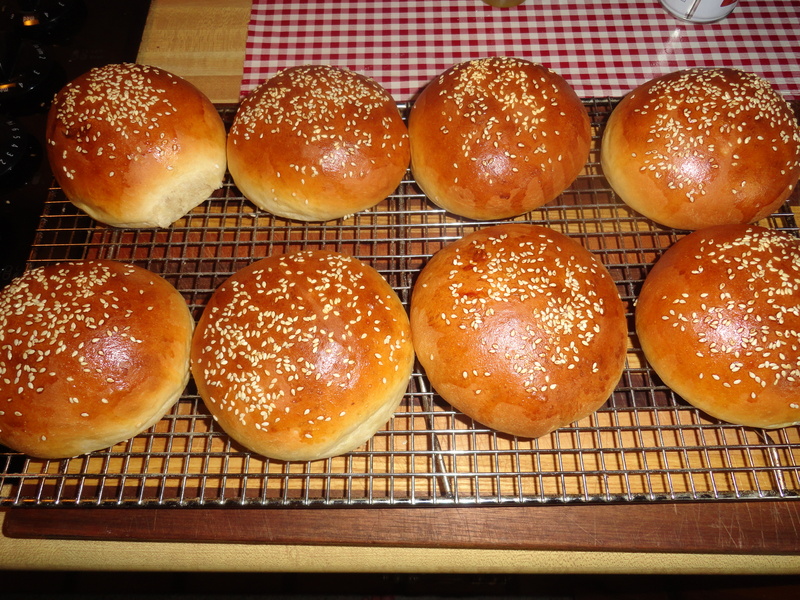 It’s not really a traditional brioche but it was easy to handle and a little milder for the hamburger sake. normally i would put a few more tabs of butter and more eggs in my brioche.^_^ ill post them another day also some danish dough recipes i need to work with that. -Then combine with flour mix for 3 minutes add butter tabs at a time and continue to mix for 3- 4 more minutes till gluten has developed. do the window test. -bulk ferment for 2 hours. -shape to 8 rolls i got 85 g each .Then rise on a parchment paper sheet pan covered with a towel for an hour. make sure to preheat oven half way and put a pan on the bottom of the oven for steam. -bake 350 for 15 minutes with stem i just throw a few ice cubes in the pan on the bottom .